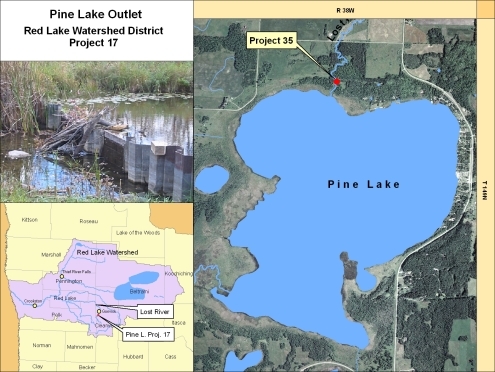 Project 26 is located near the south center of Section 21, Pine Lake Township, in Clearwater County. It is situated on the Lost River about 800 feet from the north shore of Pine Lake. The drainage area upstream of the structure is 45 square miles. In 1980, the Clearwater County Board of Commissioners petitioned the Red Lake Watershed District for an improvement of the Pine Lake outlet that would provide the public with flood control measures and wildlife benefits. The project, completed in 1981, consisted of a sheet pile dam with two adjustable stop log bays. The Gonvick Lions Club also operates a nearby aeration system to improve fish habitat in the lake. In mid June, a 2.75-inch rain event created enough runoff to raise the lake elevation. Watershed staff removed stop logs from the dam to allow increased outflow and reinstalled them when the lake receded to its typical summer elevation. Dry conditions prevailed for the remainder of 2007, causing the lake level to decline after the mid June crest. Some property owners expressed concern that the Watershed District was discharging water, but the District staff had been following the operating plan throughout this entire period. The dam structure is designed with a small fixed crest weir at an elevation of one (1) foot lower than the normal summer stop log elevation. This practice permits a minimum outflow from the lake to help maintain downstream flow. This is critical for keeping some amount of flow in the Lost River, especially during extended dry periods. District staff discovered and removed various pieces of debris that were placed over this wier with the apparent intention of blocking the maintenance flow. Beaver activity also caused some flow obstruction during the fall months.